Power BI Desktop is a free application you can install on your local computer that lets you connect to, transform, and visualize your data. 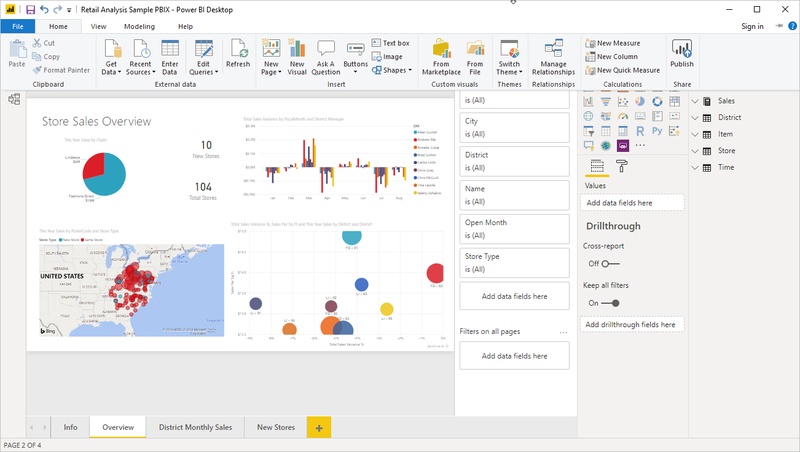 With Power BI Desktop, you can connect to multiple different sources of data, and combine them (often called modeling) into a data model that lets you build visuals, and collections of visuals you can share as reports, with other people inside your organization. Most users who work on Business Intelligence projects use Power BI Desktop to create reports, and then use the Power BI service to share their reports with others. People most often responsible for such tasks are often considered data analysts (sometimes just referred to as analysts) or Business Intelligence professionals (often referred to as report creators). However, many people who don't consider themselves an analyst or a report creator use Power BI Desktop to create compelling reports, or to pull data from various sources and build data models, which they can share with their coworkers and organizations. With Power BI Desktop you can create complex and visually rich reports, using data from multiple sources, all in one report that you can share with others in your organization. 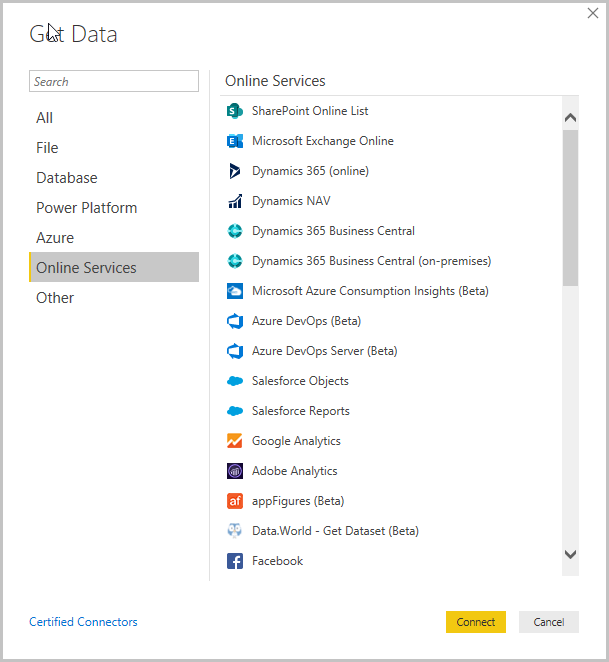 To get started with Power BI Desktop, the first step is to connect to data. There are many different data sources you can connect to from Power BI Desktop. To connect to data, simply select the Home ribbon, then select Get Data > More. The following image shows the Get Data window that appears, showing the many categories to which Power BI Desktop can connect. 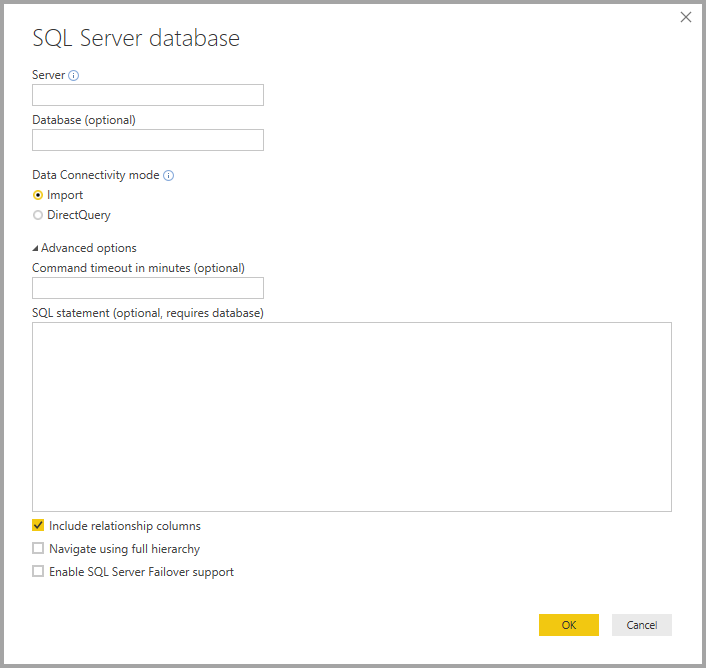 When you select a data type, you're prompted for information, such as the URL and credentials, necessary for Power BI Desktop to connect to the data source on your behalf. Once you connect to one or more data sources, you may want to transform the data so it's useful for you. In Power BI Desktop, you can clean and transform data using the built-in Query Editor. With Query Editor you can make changes to your data, such as changing a data type, removing columns, or combining data from multiple sources. It's a little bit like sculpting - you can start with a large block of clay (or data), then shave pieces off or add others as needed, until the shape of the data is how you want it. 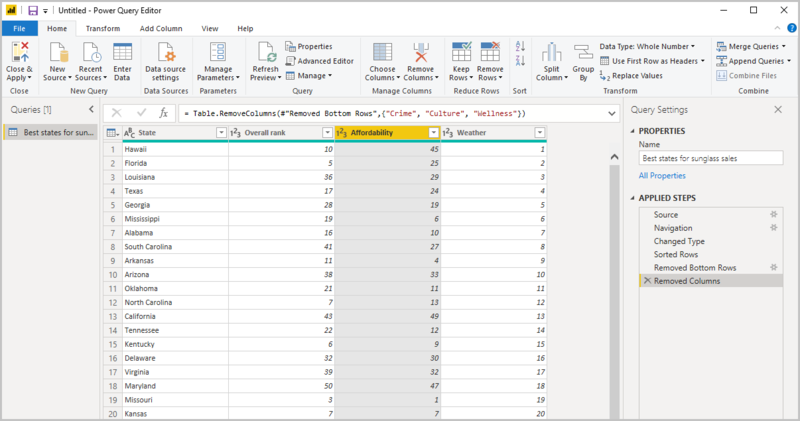 Each step you take in transforming data (such as rename a table, transform a data type, or delete columns) is recorded by Query Editor, and each time this query connects to the data source those steps are carried out so that the data is always shaped the way you specified. The following image shows the Query Settings pane for a query that has been shaped, and turned into a model. Once your data is how you want it, you can create visuals. Once you have a data model, you can drag fields onto the report canvas to create visuals. A visual is a graphic representation of the data in your model. The following visual shows a simple column chart. There are many different types of visuals to choose from in Power BI Desktop. 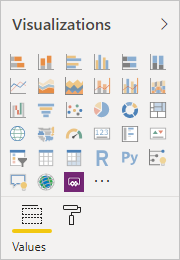 To create or change a visual, just select the visual icon from the Visualizations pane. If you have a visual selected on the report canvas, the selected visual changes to the type you selected. If no visual is selected, a new visual is created based on your selection. 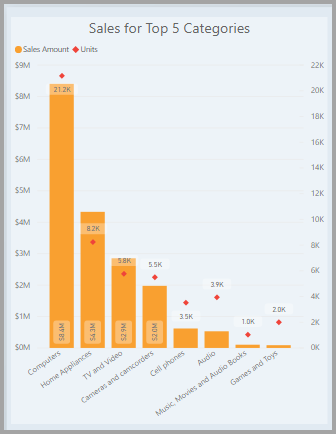 More often, you'll want to create a collection of visuals that show various aspects of the data you have used to create your model in Power BI Desktop. A collection of visuals, in one Power BI Desktop file, is called a report. A report can have one or more pages, just like an Excel file can have one or more worksheets. In the following image you see the first page of a Power BI Desktop report, named Overview (you can see the tab near the bottom of the image). In this report, there are ten pages. Once a report is ready to share with others, you can Publish the report to the Power BI service, and make it available to anyone in your organization who has a Power BI license. 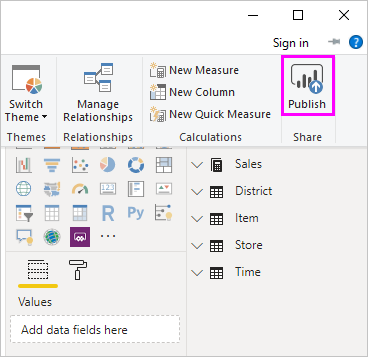 To publish a Power BI Desktop report, you select the Publish button from the Home ribbon in Power BI Desktop. Once you select Publish, Power BI Desktop connects you to the Power BI service using your Power BI account, and then prompts you to select where in the Power BI service you would like to share the report, such as your workspace, a team workspace, or some other location in the Power BI service. You must have a Power BI license to share reports to the Power BI service. Tamén podes deixar comentarios directamente en GitHub .